Kryptane caster wheels offer a specially-formulated, high-quality urethane that is designed to resist developing flat spots, ensuring that your machinery operates at peak performance. Our caster wheels have a one-piece design that eliminates bond failure commonly found in elastomer tread wheels with rigid hubs. Our wheels can handle high impact and heavy loads, do not mar floors or floor coatings, and have a quiet roll with or without bearings. Don’t settle for imitation “K” wheels! 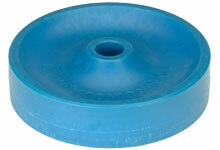 Get the original Kryptane wheels and forget your caster application problems. Proprietary formulation with physical properties and manufacturing processes engineered exclusively for caster wheels. One piece design eliminates bond failure commonly found in elastomer tread wheels with rigid hubs. Handle high impact, heavy loads. Do not mar floors or floor coatings. Quiet roll with or without bearings. Cost efficient. Light weight and long lasting. A strong performer under a wide range of conditions. Resist abrasion and compression set flat spotting. Repel dirt, cleans easily and withstands extreme temperature changes. Meet FDA requirements. Ideally suited for the food processing industry. Stand up to cooking, refrigeration and steam cleaning. Custom applications and designs welcome.